All the candidates who have successfully submitted Railway Group D application form and looking for Railway Group D Admit Card 2018 will be able to download their call letter before 10 to 7 days of examination. The Railway Group D Exam date has been released and it is expected to be held on 12th Aug, 18th Aug, 26th Aug, 9th Sep, and 16th Sep 2018. When the railway department will release Railway Group D Admit Card 2018 division wise. This is a good opportunity for candidates who want to join Indian Railway department. Railway Recruitment Board has released the application status on 11 July 2018. Although Railway Group D Admit Card 2018 is an identity proof for the examination purpose, it is also mandatory for the candidates to carry their photo identity proof also along with the Railway Group D Admit Card 2018. Railway Group D Admit Card 2018 will work as an entry ticket for the candidates who are going to appear for Railway Group D examination 2018. As soon as the Railway Recruitment Board issues the Railway Group D Admit Card 2018 candidates can download them from the official website of the board where they have applied. Candidates need to keep their login credentials including registration number, date of birth ready to download Railway Group D Admit Card 2018. While waiting for the Railway Group D Admit Card 2018, check out related details such as how to download it, what to do if there is any error and other information. Great information and well placed. I will be looking forward to the admit card updates. What is in Physical efficiency Test of Group D? Sir,in which month the admit card can be published? Thank you sir information send karne ke liye. Sir ya bharti reject to nahi hogi na . Whenever the official notification releases, we will immediately update the all the details. Keep visiting our website for the latest updates of RRB Group D Admit Card. You can also subscribe to our youtube channel for more details. Whenever the official notification releases, we will immediately update the all the details. Keep visiting our for the latest updates of RRB Group D Admit Card. You can also subscribe to our youtube channel for more details. Sir railway ka admit card kab ayega? Details will be updated soon. Keep visiting our website for latest updates. You keep visiting our website. We are going to update the details soon. 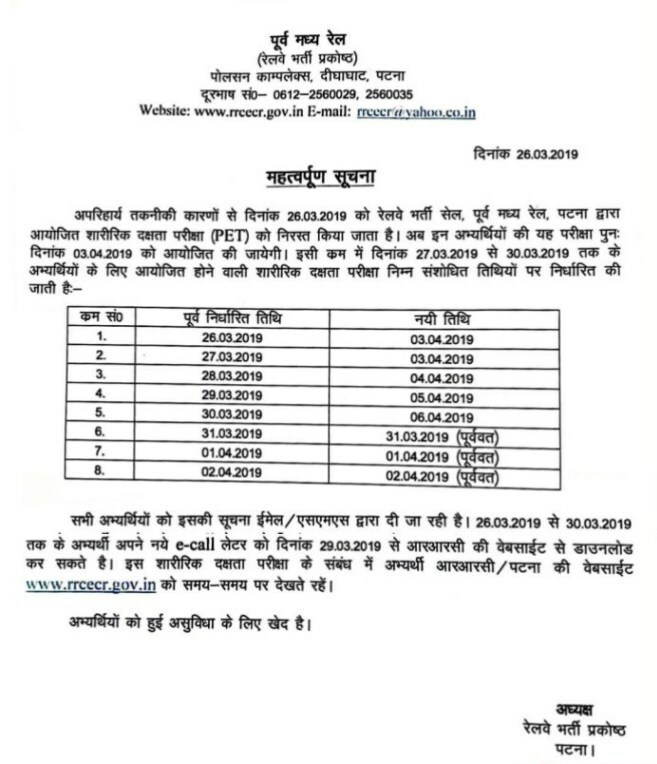 RRB D GRUB EXAM DATE . PLEASE REPLY SIR. Keep visiting our website. We will update the details soon. The Railway Group D Admit Card will be available very soon. Keep visiting our website for more details. The Railway Group D Admit Card is going to be released very soon. Keep visiting our website for more details. The exam date will be declared soon. Keep visiting our website for latest updates. Sir, Exam nhi dene par 400 Rs account me nhi aayenge kya??? when is the RRB exam…..
and when we can download the hall tickets?? Sir, please tell me . when can we show at internet RRB Allahabad admit card. RRB ALP एडमिट कार्ड कब आयेंगें? admit card group D ke kab tak aayenge sir..
Railway recruitment gruf d ka admit cord kab tak aayega Chandigarh.zone. Please sir jab v admit cord aaye to comferm kariyega.please. sir railway group d ke admit card kb aayenge. Sir exam kaise hoga online/offline? Sir bhopal ka admit card kab aayega?? The RRB Group D Admit card is going to be released very soon. To get the fastest update, keep visiting our website. Bihar Polytechnic ka councealling kab se hoga. If delay then some problem because Intermediate admission is already started through online and till now Bihar Polytechnic rank not yet declared. Please provide some details regarding Bihar Polytechnic councealling. Rrb ALP and Technician ka admit card kb ayega sir plz tell me..
…….I am waiting…. Ur reply …. Dear sir ab kabhi rrb ka vacancy aayega. plz sir update kr dijiyega iske liye bahut bahut dhanyabad aapko. You keep visiting our website daily and allow its notification on your mobile so that you can get regular updates of all Railway Jobs. Sir i am exarmy i have complete my 17 yrs job in army and i have a diploma of DCA in computer 1 year and 2 years experience of E Ticketing any job for me in Chandigarh pl reply to me yr thankful Sanjeev Kumar contact no is 7018572992.
sir mai apna registration number bhool gaya hu.pleaz koi help do. SIR I HAVENT SUBMITTED THE BANK DETAILS,HOW WILL I GET THE REFUNDED MONEY BACK?? Keep Visiting SarkariExam.com for updates. Could pls tell me about the RRB group admit card when it’s going to be released ? RRB group d ka admit card kitne baje live hoga. Admit Card will be updated just four Days before to your respective Exam Date. Admit Card will be updated just four days prior to your Respective Exam Date. It will be updated just four days prior to your respective Examination Date. on 30/September/2018 it will be updated..keep visiting SarkariExam.com. On 20/09/2018..your Admit Card will be updated ..keep visiting SarkariExam.com . Admit Card will be updated four days before from your respective Exam Date. Admit Card will be updated four days prior to your respective Exam Date. Sir mera rrb Kate admit card Abhi nhi nikal rha hai. Admit card will be updated four days prior to your respective Exam Date,keep visiting SarkariExam.com. On 30/September/2018 Exam Date will be updated..keep visiting SarkariExam.com. It will be updated soon after 14/December/2018..keep visiting SarkariExam.com. Admit Card will only be available four days prior to your respective Exam Date..keep visiting SarkariExam.com. We have failed to download admit card for group D post. Please give suggestions or help to me. Please provide your Details,so that we can help you out..thank you. Call letter for Group D not being downloading. Please help. It will be updated four days prior to your Respective Exam Date,Keep visiting SarkariExam.com Thank You. Admit Card will be updated four days before from your respective Examination Date. Admit Card will be updated four days prior form your respective Exam Date. Sir mera kab exam date hai,aur admit card Kab milega Rrb ka. Admit Card will be updated four days prior from your respective Exam Date. Sir. when my admit card will b send to me? Admit Crad will be updated four days prior from your respective Exam Date. Revised result nahi aayega kya sir..
Sir ji.. Mere answer key me 58 number and 5 question ingnored by rrb (58+5=63) but ab result me 52.71 number h..
Or gaav me ladko ke 40,38 se badkar 63, 68 ho gye.. Unka hua h ma fell hua hu.. Esa kyo..